Volkswagen has said future electric vehicles and components will be built by its plant in Germany as looks to streamline operations under a €3.5bn restructuring plan. Volkswagen e-Golf at its unveiling at the Dresden factory in Germany. Intended to transform the brand by 2020 and revive its fortunes in the wake of the emissions scandal, the plans will see VW put the focus on e-mobility and digital services while cutting 30,000 jobs, including 23,000 in Germany, to save €3.7bn per year by 2020. 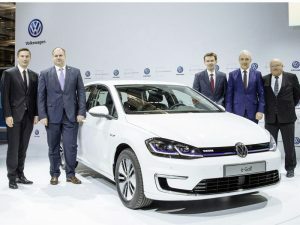 The plan comes as VW reveals the new e-Golf which will be produced at its Dresden, Germany, factory which becomes a production facility again and is being branded as a “Center of Future Mobility”.